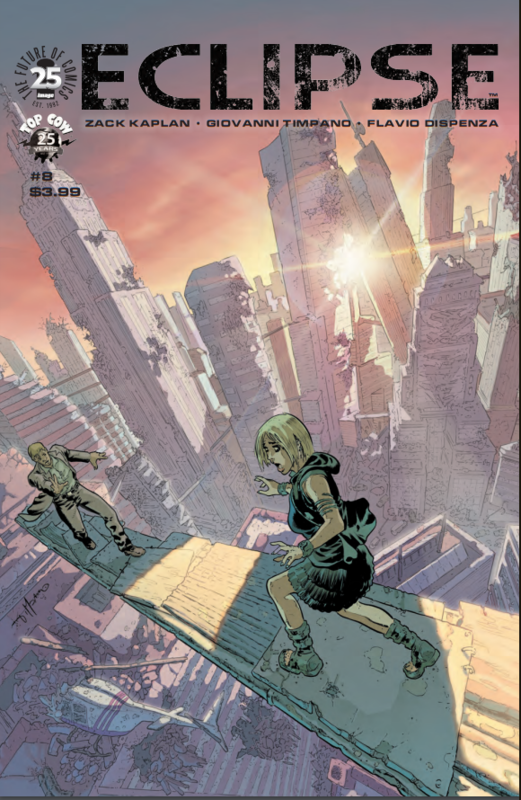 Eclipse #8 Review – AiPT! The second story arc in the Eclipse universe is heading towards its finale. When the light of the sun turns deadly and can burn anyone to a crisp in a second, the most valuable person on Earth is an albino immune to its harsh effects. David Baxter has finally found the man and rescued him, but both the Solaris company and the former mayor, with his band of militants, want him back too. Elsewhere, Cielo confronts some hard truths about what is really going on in the city and why her life was put in danger. Last issue saw Baxter, under the pretense of working for the Solaris company, track down one of the immune people to West Point, where the previous, cast-out mayor has gathered a large group of militants. They hope to find the cause of the albino Orson’s immunity and use it to take back the city. Bax is able to escape with Orson, as Wallace and some other Ice-men from the Solaris company attack West Point. Cielo, meanwhile, has found out she was being followed by the city’s police to her meeting with the head of the underground and almost gets swept out a drainage channel into the sunlight. Now she’s going undercover, into the labs that may have produced the immune people, to discover who was behind all of it. You have to give it to writer Zack Kaplan as there isn’t a lot of fat on the stories he writes. Last issue felt fast paced, but this one moves at a sprint, jumping back into the storyline where it left off. You never feel the characters are safe in the world of Eclipse as the sunlight is a constant reminder of the danger all around, but with Bax betraying Solaris and running off with Orson, the tension is ratcheted even higher as there isn’t a sanctuary for him anymore. He’s been portrayed as a solitary figure up until now in the series, but the ending of last issue and the climax of this one sees Baxter make a choice for a different kind of solitude. Before he just seemed like a damaged man, keeping his head down and people at arm’s length because of his past trauma. Now he’s become more of an independent force, determined not to get carried away by someone else’s plans or ambitions, but to do what he thinks is right regardless of the outcome. In a somewhat parallel, Cielo’s fear at being stalked by the light-immune priest had left her on the verge of collapsing inward, but instead decides to battle her anxieties and paranoia by finding out the truth behind why she was a target. The second arc has seen her taking steps in that direction, leading up to the meeting with the head of the underground. Now she faces the harsh reality that digging even deeper could reveal truths about the city and her father that she could never escape. There’s a great scene that metaphorically shows her choice, drawn expertly by Giovanni Timpano. If they had more real estate, issues #7 and #8 would fit together like jigsaw pieces as the story continues without missing a beat. You never get the feeling the book is floundering about trying to find a direction, or that it’s lost you, or that there won’t be enough time to finish what they started. The second arc has been excellently edited and plotted to arrive where it’s supposed to, without any dead issues full of characters self-reflecting or using exposition to fill space until the next chapter. As a bonus, anyone interested in comic writing, or writing in general, should check out the “behind-the-scenes” section at the end of the issue, as Zack Kaplan lays out everything that goes into writing the story. Can’t wait until the conclusion next month, but sorry to see it end. Which is just how it should be. Eclipse is setting a standard for gripping, fast-paced storytelling, full of tension and believable characters. It has only gotten better as it reaches its second story arc conclusion. You’re not going to find better pacing or tighter script than issue #8--or the rest of the second arc of Eclipse. It looks great, once again, due to the effort of Timpano, whose art and portrayal of the apocalyptic world is both familiar and unique. Kaplan mentions at the back of the book that the creative team will be taking a break after the next issue...sigh...here’s hoping they’ll come back refreshed with even better Eclipse stories to tell!